Last week we announced the first Hatena Blog Topic "Summer Hobbies and Activities". There have been some excellent entries, but many people in the community have still not posted. Please remember to post your entries by August 8, 2013 (Thursday) at 8:00 am US Pacific time! Here is a quick tutorial about how to post a Hatena Blog Topic entry of your own. 3) Read the description for the Hatena Blog Topic, and scroll down to check entries written by other bloggers. 5) After you click the button, a new blog entry window will appear, and the keyword text required for your entry will automatically be inserted. Do not erase the automatically inserted text or your blog will not be entered! 6) After you have written your blog entry share it with friends on Facebook and Twitter. 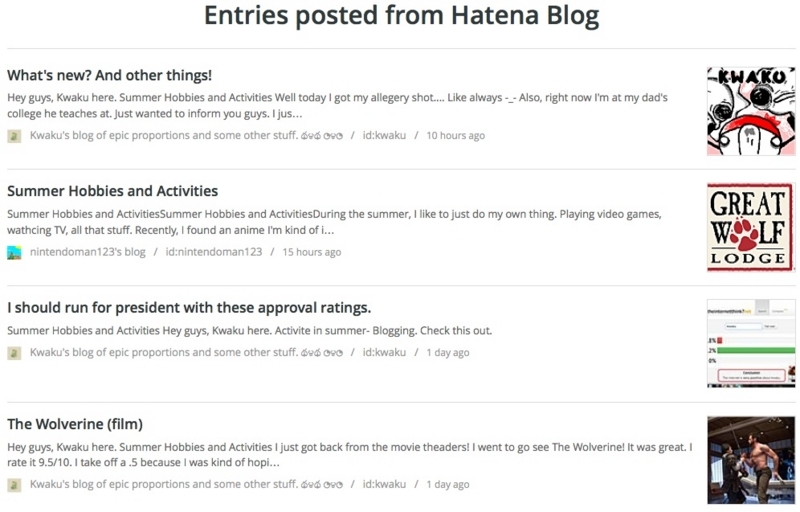 7) Invite your friends to write a blog entry for the Hatena Blog Topic too! Hint: You can also write a Hatena Blog Topic entry at any time by clicking on the Hatena Blog Topic button in the blog editor window. Remember, do not erase the automatically inserted text or your blog will not be entered! We are looking forward to reading about your "Summer Hobbies and Activities" and hope this topic inspires you to write some new blog entries!